Questar held its second quarter earnings conference call on Wednesday and got into some detail about the Haynesville Shale. In fact, the company led the conversation with its emphasis on the Haynesville Play and its Pinedale Anticline play in the Rockies, noting that each play will be allocated 40% of Questar's $860 million capital budget. The CEO also referred to Haynesville as "our high margin Haynesville Shale play," which seems pretty positive for a company that's involved in a number of gas plays. YTD, the company has participated in 12 wells and anticipates partcipating in a total of 35 for 2009. Average well costs are around $9 million. Since the first quarter earnings call, Questar has drilled four wells and participated in another. These five wells are shown in red outlined boxes below. There are some fat initail production (IP) numbers in there! Hutchinson 10H #1: 12.2 MMcf/day; Questar tried a new frac design of smaller frac jobs on this well that "negatively affected the initial rate." The company tried a "less is more" approach and found out that less is unfortunately actually less. Both the Rex Young and Sustainable Forest wells have been choked back to 10 MMcf/day because of low gas prices. In the Q&A, the company mentioned that the wells "touched 30 million (cubic feet) a day" but the company's flow back equipment can't handle anything greater than 25 MMcf/day. Questar would have to install a second set of flow back equipment to register the higher IP. You know Questar is itchin' to open the spigot! In addition to curtailing some production because of low gas prices, the company is also delaying completion on some wells. 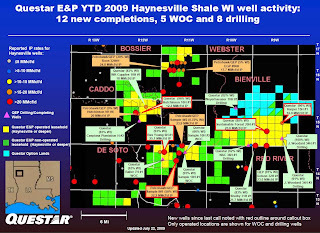 In terms of takeaway capacity, Questar "currently holds about 65 million cubic feet a day of firm capacity with over 300 million cubic feet a day of additional firm capacity under contract to begin deliveries in several tranches beginning in 2010."